The Pentagon’s latest report on China’s military notes its rapid advances in space. Should other countries worry? China is developing a multi-dimensional programme aimed at improving its ability to limit or prevent the use of space-based assets by adversaries during a crisis, the Pentagon says in its latest report on the country’s military. Is this another step toward a ‘Star Wars’ missile defence shield? Certainly according to South Korea’s Chosun Ilbo, it is. ‘China is developing a missile defence system in the highest layer of the atmosphere and outer space using high-end technologies like laser beams and kinetic energy intercept,’ the paper notes as it dissects the report, which has just been presented to the US Congress. ‘China launched nine new remote sensing satellites in 2010, which can perform both civil and military applications. In 2010, Beijing also launched two communications satellites (one military and one civil), a meteorological satellite, two experimental small satellites, and its second lunar mission during the year,’ the report adds. China’s advances are giving it the capacity to jam common satellite communications bands and GPS receivers. Meanwhile, ‘China is improving its ability to track and identify satellites – a prerequisite for effective, precise counter-space operations,’ the report says. The problem for US and other analysts is that as with much else about China’s military advances, it’s difficult to establish with certainty what China’s intentions really are. According to Joan Johnson-Freese, a professor of national security affairs at the US Naval War College, there are several reasons for this, the most important being that a very high percentage of space technology – probably about 90 percent she estimates – is dual-use, meaning of value to both the civil and military communities. ‘And in the military realm it’s difficult or impossible to distinguish offensive from defensive intent,’ she says. An indirect result of Chinese secrecy was international condemnation of its decision in 2007 to conduct the ‘killing’ of a satellite. 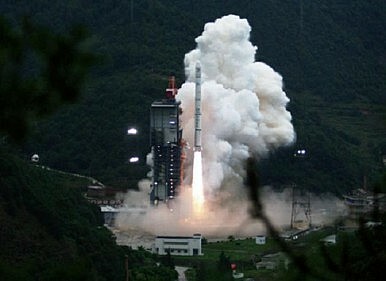 On January 11 of that year, China used a missile to destroy an aging Fengyun series weather satellite. The test was a success, but prompted an international outcry and concerns that it was further evidence that China had taken another step toward the militarization of space. Regardless of China’s advances, Navy War College professor and frequent The Diplomat contributor Andrew Erickson argues in an interview with Flashpoints blogger David Axe that it’s not in China’s interests to even try to compete with the United States. According to Axe, this essentially means that spacecraft are highly vulnerable to physical and electronic attack, and so are their control stations. To avoid these ‘asymmetric’ assaults at which China has proved particularly skilled, Axe quotes Erickson as saying that the Pentagon should take its current space-based equipment and move it downward to the atmosphere as the air is more secure than space. As Axe notes, though, Erickson’s is a relatively lonely voice in urging the Pentagon to embrace what would be an orbital retreat. China is making rapid progress in developing satellites for tactical military use, a new report suggests.